Street vendors sell vegetables at a local market outside a state-owned coal-fired power plant in Huainan, Anhui province, June 13, 2017. 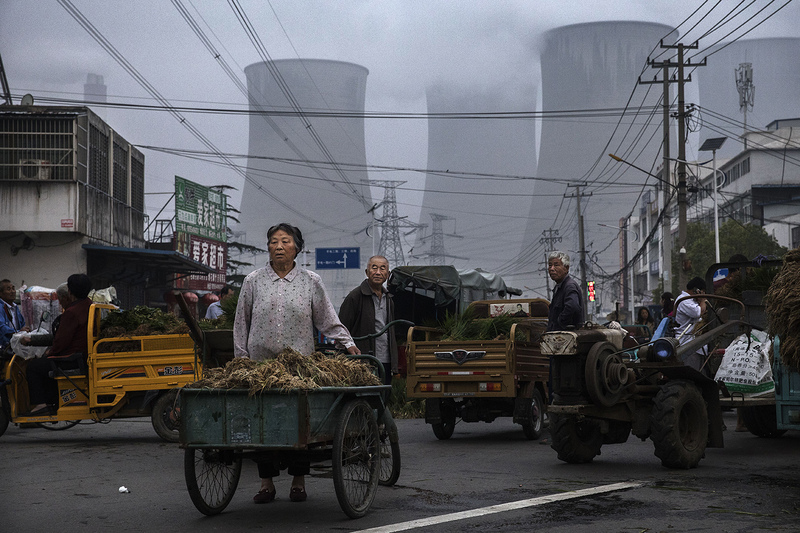 Air and water pollution are rising in China, and so is the number of lawsuits against polluters. Access to the courts is growing: Chinese prosecutors and some NGOs have been empowered to sue polluters, and activist lawyers increasingly participate in lawsuits. Recently, five activist lawyers brought a lawsuit against Beijing, Tianjin, and Hebei Province, charging these local governments with not doing enough to reduce pollution. Previously, inspectors from China’s Ministry of Environmental Protection and its local Environmental Protection Bureaus (EPBs) had censured officials in Tianjin for failing to address serious environmental problems. The Civil Procedure Law and the Environmental Protection Law (EPL) amended in 2013 and 2014, respectively, empowered NGOs that have been registered and operating for more than five years to bring “public interest lawsuits.” Before this, environmental lawsuits against polluting enterprises were largely brought by citizens and communities. In July 2015, the Supreme People’s Procuratorate implemented public interest litigation in 13 provinces, cities, and autonomous regions to protect “the eco-system and natural resources,” as well as food products, medicine, state-owned assets and transfer of rights to use state land. On June 27, 2017, the Standing Committee issued a decision that extended the powers of prosecutors to file public interest cases nationwide. The growing role of lawsuits to punish illegal pollution is welcome, but progress is slow. The ability of NGOs to bring environmental lawsuits against polluters is being contested. In January 2015, the amendment of the EPL permitting NGOs to bring environmental public interest cases took effect. It authorized suits against polluters, but not against government agencies. Even so, several lawsuits have been brought by NGOs against government entities for violating environmental laws, but so far they have been rejected; this limitation is now being challenged. In one case an NGO, Friends of Nature, sued a local EPB in Yunnan Province, arguing that the Bureau had illegally authorized the building of a plant to produce a volatile chemical. The defendant company, Fugong, had begun construction without filing an environmental impact assessment, as required by the Environmental Impact Law (EIL) adopted in 2002 and amended in 2016. The EPB imposed an administrative penalty and ordered Fugong to halt construction and reapply for approval; Fugong complied, and its reapplication was approved. After the EPB decision, Friends of Nature challenged the approval because the Bureau had not followed the amended law. After the Bureau failed to respond, the NGO sued the EPB in two administrative public interest suits. The court dismissed the suits on the grounds that the Administrative Litigation Law did not authorize the NGO’s lawsuit. In an article on the case for chinadialogue, William Schulte and Li Haitang note that the Administrative Litigation Law authorizes complaints against “citizens, persons, or any other organizations” against government actions that infringed directly upon their rights or interests. In lawsuits involving the Environmental Impact Law, local residents and village groups have been accepted as “interested parties” in their lawsuits according to a Beijing University study. Even before the law expanding prosecutors’ power to sue polluters went into effect, the first “administrative public interest litigation case” was filed. A prosecutor won a suit against a county environmental department because it had imposed only “nominal administrative punishments” on a sewage firm that had produced dye without necessary safeguards. Local governments are increasingly being targeted for punishment because of failure to act against local polluters. This year, a massive campaign was launched by the Ministry of Environmental Protection against excessive environmental pollution. Inspectors from environmental bureaus were sent to factories in 31 provincial-level administrative regions, where they “reprimanded, fined, or charged officials in more than 80,000 factories with criminal offenses” for violating environmental laws. One of the most important developments in environmental litigation in recent years has been the increase—albeit slow—in lawsuits against government agencies. There were 225,000 in 2016, an increase of 13.6 percent over the previous year. The increase reflects recent changes in the Administrative Litigation Law: an increased scope for admissible cases, reduced court discretion to reject cases when they are filed, and a requirement that the person in charge of the administrative organ that is being sued must be present at the oral hearing of the case. An example of attacks on the same problem by both private and state actors is the unusual lawsuit brought by five activist lawyers noted at the beginning of this article. It charges the governments of Beijing, Tianjin, and Hebei Province with not doing enough to reduce pollution. The Ministry of Environmental Protection had already censured Tianjin officials for failing to act against the city’s steel and motor vehicle plants. “Some 1,414 officials were held accountable in Tianjin, which tripled fines on polluting companies to 249 million yuan” in the first ten months of this year, according to a report In November 2017. Not surprisingly, pressure has been brought against the five lawyers, and a “blanket ban on any discussion of the case” has been issued. Their initial filing was rejected on the grounds that a separate case against each government had to be filed. The cases have been refiled and the lawyers are waiting for the courts to respond. Professor Stern expressed doubt that the cases will even be accepted by the courts. Since then, she says, in March 2017 the chief lawyer in the group tried to file a case in the Beijing 2nd Intermediate Court against the Beijing city government on grounds of administrative inaction, but it was refused. Environmental litigation is an area in which citizens can act to protect themselves against unhealthy pollution and at the same time it is also an area in which the central government is able to act powerfully to protect citizens. Consequently, activist lawyers operate between two extremes: encouraging public protests, which are strongly opposed by the government, and protecting citizens’ rights to use litigation to punish polluting enterprises. The current activities of NGOs, citizens, and prosecutors suggest that environmental litigation generally is in a “no man’s land.” At present, the emphasis on reducing pollution may necessitate continuing the current mustering of resources to use the courts. The Party-state’s fixation on strengthening “social stability,” however, won’t go away. If public interest litigation grows, and with it public opinion favoring the desirability of increasing it, policy could change and limits could be imposed on such litigation. This would be entirely consistent with the People’s Republic of China’s treatment of legal institutions as instruments for implementing policy rather than supporting the rule of law. The broadening of the scope of environmental public interest cases that can be brought by an expanded range of actors creates possibilities for considerable progress in the use of the legal system to control pollution—if, and only if, the government of Xi Jinping allows it.